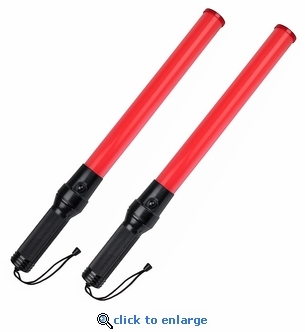 These bright red emergency light wands can be used for traffic control, signaling at schools and events and roadside emergencies. The signal light wands feature two operation modes, constant on and blinking for extra visibility. Signal wands are standard safety equipment used throughout police and fire departments and air traffic control. Sold in sets of 2. Use the quantity box for the number of sets. Anti-slip comfort grip with wrist lanyard. Set of 2 Hand Held Stop Signs / Slow Sign - 2 Sided - 18"